Hello everyone! 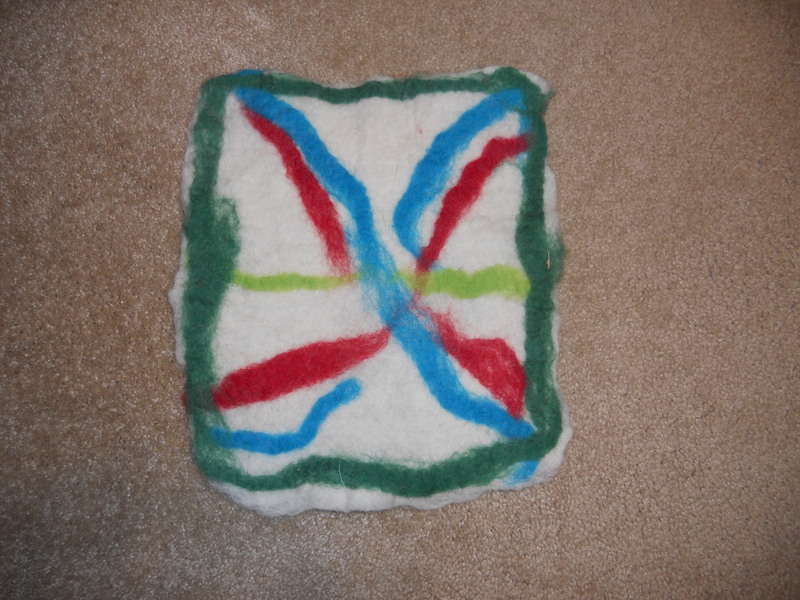 I had the great opportunity to spend 5 days and nights with my Grandaughter at our house last month and we had a really good time making a felt square. Its very easy and simple to do and the kids really get a kick out of being able to make something out of relatively nothing. I hope you have fun felting and if you have any questions feel free to ask me. Just use the comment box or check us out on facebook. Just look for Once Upon A Fiber.Com and message me there. You can get your felting supplies at www.livingfelt.com for a really good price. You get more bang for your buck there than anywhere else that I have found so far. I strongly recommend purchasing supplies from them. You wont regret it. I would start off getting the white core wool for wet felting and then just buy a few colors of the wool roving if you dont plan on going into business and maybe you can find someone to go in on it with you cause you will get a lot of white core wool. Enough for several maybe 30 or 40 squares. They also have the bamboo or plastic to make your rolls with and the netting. And I dont get anything for sending you to them. I have just checked out all of the craft stores and was thankful that I purchased my stuff from livingfelt.com. They have videos on their site to help you learn all about wet felting and other types of felting. They are a great Company. Dont forget to keep those Granbabys busy! Until Next time may your hands work be blessed and your fiber work fulfilling! Happy Creating!